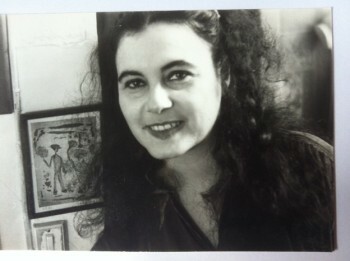 Dear Anne-Marie, Here in Central France, in the month of April (2017), surrounded by nightingales singing like mad (in the dazzle of noon as well as by night), I am (re)reading your books four and a half years after you left us—your collected writings (Cinq le Choeur: 1966-2012, Flammarion, 2014). I want to see and hear your writing anew. What was it that drew me in, captivated and led me to write on your work, eventually to meet you? 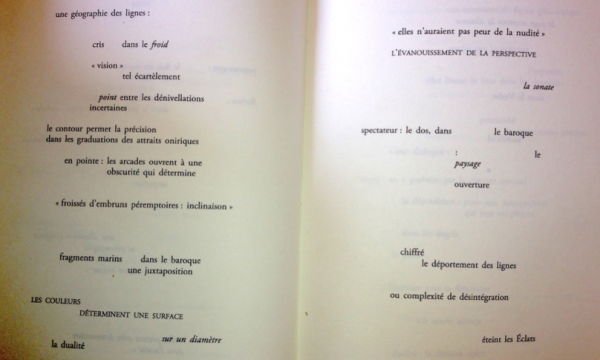 I remember first discovering some of your pages in a (then new) anthology edited by Henri Deluy, Poésie en France, 1983-1988 (Flammarion, 1989), a selection from Mezza Voce, including Esquisse: “le froid” (“PULSION: née dans les sommeils/ elle élabore la scene du jour”) and perhaps “Théâtre” (“une fiction blanche reprend sa ponctualité”). What’s this!? A poetry nearly without image, ruthlessly suspicious of metaphor, visual in an “abstract” way that is not decorative, sounding in a way that is not “concrete” yet almost overwhelmingly physical in its mental exertions. I wanted to know, still want to know it, more closely. Can your “theatre of the page” grip those outside of French poetry, not already under the spell of Racine, Rimbaud, Mallarmé, Jabes, Jouve? I like to think so. You also were a close reader of Shakespeare, Zukofsky (whose “A” 9 you translated), Kafka. You benefited from excellent translations of your work by the Waldrops, Simas, Bernstein, and others. Your praises have been sung by poets as different as Palmer, Swensen and DuPlessis. I suspect a description of your work is inseparable from the phenomenology of each reader’s engagement, from what I read in your pages today. Mezza Voce—the open scene of your work. A collection of word plays, stagings of language: Distance: “Analogie”, “Le voyage d’hiver”, “La voix extrême la lumière”, “. . . Où la forêt est la plus sombre”, Esquisse: “le froid”, “Théâtre”, “DiScours”, Objet, Le double, CÉSURE: le corps, La nudité comme apparat, Strates . . . Even this list of titles throws conventions of punctuation and capitalization into question. It is a “theatre” of the page, choreography of letters. A ritual or hieratic dance, with vulnerable joints (wrists, ankles) offered up to the stage lights at crucial moments: words and phrases in italics, all caps, quotation marks move in from the margins, take up positions either side of the gutter, strike static poses. Language that does not bear the weight of obvious meaning finds freedom in rigid articulations, in the way breath translates directly into the movement of a marionette’s limbs. (I’m thinking of your wonderful piece on Kleist in Anawratha, your collection of critical writings.) The eros of these stilled yet moving limbs is at white heat. On the other hand (and here the connection with Claude Royet-Journoud is crucial, and through him and others perhaps with certain aspects of the “Black Mountain” emphases, with Creeley more than Olson), what you present is (nothing more than) a body writing, referenced from moment to moment, gambled beyond narrative and logic, on the impulses of breath. Yet lent the splendor of a pageant (“LA NUDITÉ COMME APPARAT”): I think of the tableaux of Parajanov, in his film on the life of Armenian poet Sayat-Nova (Color of Pomegranate). Except without images—a silent film with no scenes, only captions in the projector’s blinding light. Something of the mystery play, the masque inheres in the poise of all caps and italicized words across, say, the spread of Esquisse: “le froid” (“CONSTAT . . . INCISION . . . ORNEMENTS . . . OBJET . . . SCÈNE . . . DÉPORTEMENT”). But the style is baroque not medieval, with movement introduced in the swerve (“DÉPORTEMENT”) and shimmy of syntax, as the eye moves down the page, in the references to curves and calligraphies, to a geometry of rested impulse, “le Souffle/ sculptural.” As with sculpture (the white page of “Le voyage d’hiver”), the articulation is both tacit and sounded: statement, erasure, impulse recaptured. Your language is “recidivist,” falls back on itself—writing as the effort (you have said) of the body, “bearing the blank of the fiction that divides it,” to get up. A body offered to grammar, written in bruises and scars. The testimony, not reportage, of violence: far too close (for comfort) for voyeurism. Every metaphor indicted, placed in quotes, the language has thoroughly read itself, for the reader who looks into a dizzying reading of the reading of the poem. Phrases caption other, suppressed phrases—yet with the physicality of anterior and prospective immediacy, as writing opens the body in search of ancestral warmth. To locate memory inside the body, writing as descent (you said), into the cave to rediscover the ancestral light, to try to put it out to be reborn (as in one of your key texts, Mallarmé’s Igitur). What the body aspires to be is re-membered, in a catalog of gestures, language emptied of expression, replaced with quoted intervals: interruption, displacement; overheard intercut fugal structures; a play made entirely of stage directions. When I wanted to translate “étreinte” as “grip” and you said, no, it’s an “embrace,” the truth for me remained somewhere in between, in that exchange—your page is loving, intimate, but also severe. It’s not jazzy but terrifyingly poised (the resemblance to Olson’s “composition by field” only skin deep). There’s a sense in which one could be blinded by language, that language is already operating beyond the shadows of sight, in a realm of invisible but utterly concrete realities. Polyphonic, multiply voiced, Bach in syntax. Your much earlier, foundational book État builds this stage and its machinery—it’s the ur text, really, your method, of writing not on or with, but in the space of the page. 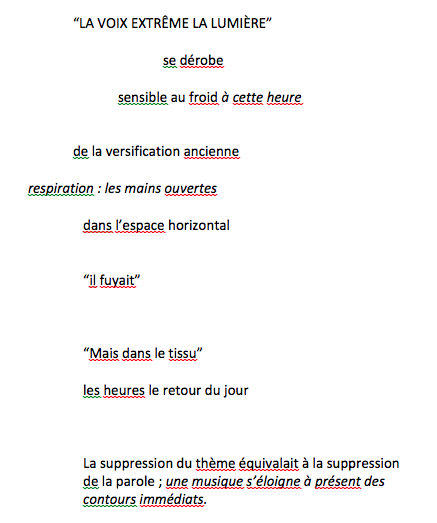 In État you establish spacing (Mallarmé’s “espacement de la lecture,” or, in your terms, “compacité du déplacement”), how it takes breath, and bodily tension, into another grammar, one articulated by silences as much as words. I’m thinking of Joanne Kyger, a very different sort of writer who embraced the syntax of space with just as much precision and elegance. Anyone who thinks your mathematics are metaphorical need only look at the structure of État: a book-length poem in two sections dividing the book exactly in half, Enigme and État. The mirror-like structure is offset by unequal subdivision of the equal sections: Enigme an ennead, of nine parts, while État has four parts. The second half of the first part of État is a Commentary or monologue on the first half; the second part is made up of successive Retrospectives of its first movement (opposition : I), while the third part offers a Commentary on the preceding event; finally, the fourth part, Term (the infernal), contains a Rétrospective: what preceded, how. A Table at the end of the book sums this structure up. As you confirmed in an interview, it is a spiral structure—inspired by the image on the Egyptian tarot card of a woman caught in a spire. Does it work in English? Yes, at least in the sense that typography must accompany your translations. Yet so much of your writing’s sensuality inheres in the way words like “poitrine,” “taille,” or “chevelure” stand exposed, with all the Gallic fullness of their eros, within a severely reduced vocabulary (you are most Racinian in this regard), how much the formal conduct of the Alexandrine sounds tacitly within the luxury of your misconduct. Your writing is destined (like much great poetry) to mistranslation—it cannot but be “mis” apprehended in the environments of British or American English. 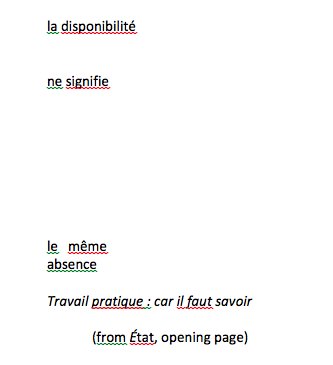 (Given how you write across the spread, there can be no question of “facing” translations: what of an electronic edition that might reveal the French “beneath” the English?) That is all right: I don’t care how readers fall in love with you, but I want them to fall in love. I can use these terms because your writing is impersonal yet utterly intimate. One never quite feels familiar with one of your books, yet such are its premonitions of desire that awe succumbs to intimacy, fear to love. Do I embrace your kind of writing? I think not. (When first under your thrall, I shared some poetry with a friend, who told me to “stop wearing the language on my sleeve.” I must not have the visual confidence to work with the page in that way.) But could I write with as sure a sense as I do now, at the very least, of what isn’t working in a given draft, without the knife of a sensibility (“aesthetics/ our only immortality”) sharpened on the pages of your work? You have opened our eyes and ears, concretely and beautifully, alerted our hearts and minds to the stakes of writing, to what is given, to what can be gained and lost, when necessity embraces chance as wrist meets blank sheet, as breath pushes thought inspiring perception, as terms cut in, as blasphemy must be done. If I think of the page as the earth, the very ground beneath our feet, then perhaps, yes, I do embrace your example. Rereading one of your earliest texts, Flammigère, I realize today that one of the flames your work carries is that of the earth itself, as birds vary their repetitions in the lengthening shadow of the leaves: the engendering heat that moves your writing, that moves our reading of it, that is the movement of life in and out of the ground, is one and the same. 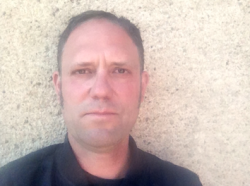 Jonathan Skinner founded the journal ecopoetics. His books include Chip Calls (Little Red Leaves, 2014), Birds of Tifft (BlazeVOX, 2011), Warblers (Albion, 2010) and Political Cactus Poems (Palm Press, 2005). He teaches in the Writing Program at the University of Warwick.